Dunkin’ Donuts is owned by Dunkin' Brands Group, Inc. (Nasal: DNKN), one of the world's leading franchisors of quick service restaurants. Dunkin’ Brands is the parent company of both Dunkin’ Donuts and Baskin-Robbins. Dunkin' Brands Group, Inc. is headquartered in Canton, Massachusetts. At the end of 2014, Dunkin’ Brands Group, Inc. had franchisee-reported sales of approximately $9.8 billion. Dunkin’ Brands, the parent company of Dunkin’ Donuts and Baskin-Robbins is one of the largest QSR (quick service restaurant) companies in the world with more than 19,000 points of distribution in more than 60 countries worldwide. Dunkin’ Brands Group, Inc. has a nearly 100 percent franchised model. There are more than 11,500 Dunkin’ Donuts restaurants in 40 countries. Dunkin’ Donuts’ coffee heritage goes back 65 years – something no other leading restaurant brand can match. Dunkin’ Donuts sells more than 1.8 billion cups of hot and iced coffee globally every year. According to The NPD Group / CREST®, Dunkin’ Donuts serves the most traditional hot and iced coffee in America. In the highly competitive U.S. coffee market, Dunkin’ Donuts is distinguished for brewing a superior guest experience. For nine years running, Dunkin' Donuts has been recognized by the Brand Keys Customer Loyalty Engagement Index as number one in customer loyalty in the coffee category. Dunkin’ Donuts coffee is freshly ground, freshly brewed and freshly served. If not used within 18 minutes, Dunkin’ Donuts coffee is discarded and a new carafe is freshly brewed. Like creating a fine wine, there are countless steps involved in producing coffee, and Dunkin’ Donuts coffee experts travel around the globe to ensure consistent quality at each turn. Dunkin' Donuts uses 100 percent Arabica coffee beans and has its own coffee specifications, which are recognized by the industry as a superior grade of coffee. Based on Dunkin' Donuts Quality (DDQ) specifications, coffee is milled and processed specifically for the company. Dunkin’ Donuts is the #1 retailer of freshly-brewed iced coffee. Each Dunkin’ Donuts restaurant double brews the coffee before pouring it into cooling units to make sure its iced coffee is always full of flavor and never watered down. Dunkin' Donuts' lattes and cappuccinos are authentic - made with only Fair Trade Certified™ coffee beans blended for espresso and fresh milk – and available in regular or decaffeinated, hot or iced. The beans are ground and the milk is steamed for each individual serving. Dunkin' Donuts was the first national brand to sell espresso beverages that are made exclusively with Fair Trade Certified coffee. 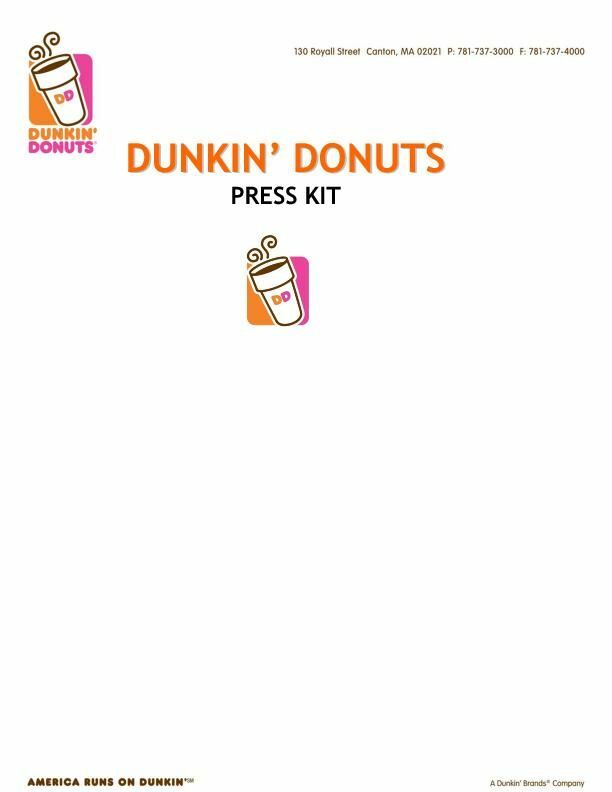 Dunkin’ Donuts now offers Dunkin’ Donuts K-Cup® portion packs, making “America’s Favorite Coffee” available for use with the Keurig® Single-Cup Brewing system. Sold exclusively at participating Dunkin’ Donuts restaurants in the United States, Dunkin’ K-Cup® portion packs are offered in five popular flavors, including Original Blend, Dunkin’ Decaf®, French Vanilla, Hazelnut and Dunkin’ Dark® Roast. Dunkin’ Donuts’ coffee excellence team features two of the world’s foremost experts on coffee, Jim Cleaves and Ellen Rogers. Both are dedicated to helping Dunkin' Donuts brew the perfect cup each and every time. Jim is a licensed Q Grader, having passed the world’s most rigorous coffee evaluations skills testing program, while Ellen is an International Coffee Expert in coffee tasting and analysis and a Coffee Quality Institute Board Trustee. They each travel regularly throughout the world, tasting as many as 600 cups of coffee each day in order to choose the highest quality coffee beans for Dunkin’ Donuts.